Just how huge is Apple's 30-inch Cinema HD Display? Well, a magazine-spread layout being produced in InDesign (such as MacFormat) displays at about one-and-a-half times its actual size. Photoshop displays a six-megapixel file at 66.7% with plenty of room left over for piles of palettes. To give you another example, a default Microsoft Excel spreadsheet with View > Zoom set at 100% is 116 rows tall and 33.5 columns wide - that's 3,886 cells. Also at 100%, Word's Page Layout view displays eight pages at once. This display is so ungodly large that it takes a bit of getting used to. You need to set a faster mouse-tracking speed, develop a sharp eye for finding your cursor, and get accustomed to swivelling your neck like you're watching a tennis match as you move from the Apple menu to the right side of the display. The effort is worth it. The 30-inch Apple Cinema HD Display is by far the finest monitor to ever house the Mac OS X desktop. Of course, a hefty display has hefty hardware requirements, and as fabulous as this display is, few of us will ever get to enjoy it. 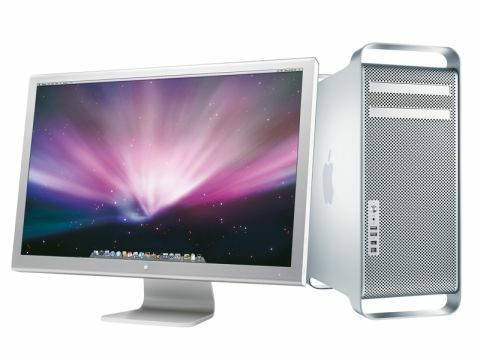 Firstly, at £2,099 it's a little bit pricier than even the most high-end Power Mac G5 - and you will need a Power Mac G5 to run it because the screen requires an Nvidia GeForce 6800 Ultra DDL (£399), a GT DDL (£349) or an ATI XT800 graphics card (£266). The two Nvidia cards are longer than typical PCI cards and their heat sinks and audible fans stretch out over the adjacent expansion slot, rendering it unusable. This new breed of monster video card supports two DVI displays. If you can afford it, a pair of 30-inch screens will provide absolute desktop indulgence. Like its smaller brethren - the 20-and 23-inch Cinema Displays - the 30-inch Display has a durable anodized aluminium case that's VESA-compliant for mounting on walls or articulating arms, plus dual FireWire 400 and powered USB 2.0 ports. The bezel around the display is less than an inch wide, and the display itself is just under two inches thick. The display sits on a tension-hinged aluminium pedestal, with a low-friction base and controls that are a bit too easy to brush on the right. At 27.5lbs (12.5kg) this is no lightweight, but even a 21-inch CRT-based monitor can be up to three times as heavy. The Cinema HD Display's abundant screen real estate may change the way you work. Some of us felt more comfortable with it pushed back a good eight to ten inches further than usual to get comfortable with its wide field of vision - and then felt uncomfortable with it being so far away. Others felt immediately comfortable at normal viewing distance, and relished its wide open space for layout, audio, video and image editing. Spreadsheet users were in heaven; word-processing editors loved being able to display a full page of 8.5-point type at a setting of 200%; Safari surfers scrolled less and saw more. Colour fidelity is excellent. You may be a nose-to-the-display Photoshop pixel-pusher, but you'll still notice remarkable colour consistency, even at extreme angles. Pixel response time is snappy, so when you gather your family around the display to watch widescreen DVDs, there's no image smearing, even when the on-screen action is fast and furious. The display is also quite bright (the quoted brightness level is 270 cd/m2) and is noticeably brighter than a CRT. Like us, you may find it's a bit too bright at maximum setting. Our one small gripe is the absence of a height adjuster, but you could always overcome this by standing it on a pile of your MacFormat back issues.